I recently posted that for a coworkers birthday I wanted to make two kinds of Whoopie Pies... I personally wanted a S'more based dessert, but coworker LOVES Red Velvet. I made S'mores Whoopie Pies, rather gratuitously, and Red Velvet for her. Granted, these don't look to pretty, they were a huge hit. The pretty factor was all me - I was having some difficulties with my piece of a cookie scoop. They were rich, moist and creamy. I loved that the cakes weren't too sweet, since the filling was pretty darn sweet. One thing I will say about these Whoopie Pies is that I was shocked at how thick the batter was. I've seen blog posts with people piping the dough, but when I saw how thick it was I chose not to because I thought it was too much... maybe I was wrong though. Also, another note - I do think I should have chilled the filling a little before assembling. Chilling it would stiffen it up a bit, therefore making it less likely to spill over the cookies once sandwiched. Regardless of the slight issues - still delicious, and that's all that matters! In a large mixing bowl beat butter on medium to high, 30 seconds. Beat in brown sugar until light and fluffy. Beat in egg and vanilla. Alternately add flour mixture and buttermilk, beating after each addition until just combined. Stir in food coloring. Spoon batter in 1-2 inch diameter rounds, about 1/2" high on prepared baking sheets, allowing 1" between each round. Bake 7-9 minutes for 1" cookies, or 9-11 minutes for 2" cookies, or until tops are set. Cool completely on baking sheets on rack. Remove cooled cookies from baking sheets. To fill, dollop Whoopie Pie Filling on flat sides of half the cookies. Top with remaining cookies, flat sides down. To store: refrigerate in airtight container up to 4 days. Let stand at room temperature 15 minutes before serving. (I recommend chilling for a little bit to stiffen up some before assembling cookies/pies. 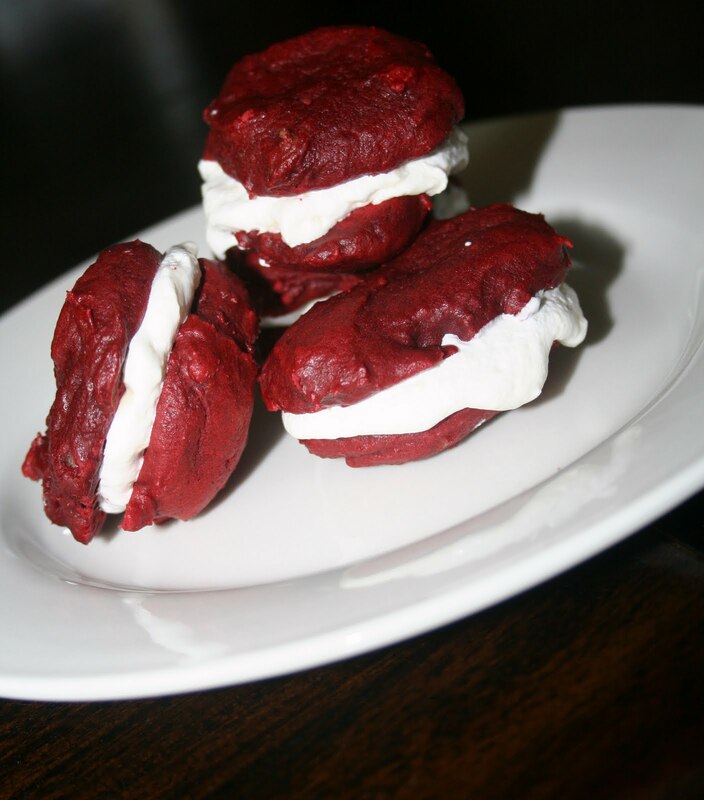 you're on a whoopie pie kick! looks good! love red velvet!